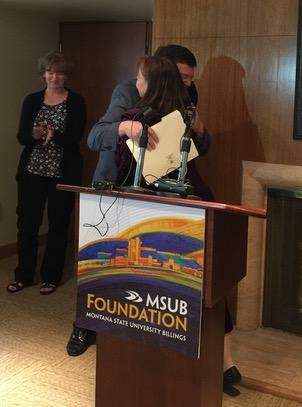 Incoming MSUB Foundation President and CEO Bill Kennedy gets a hug from Foundation Chair Bobby Anner-Hughes during the press conference. 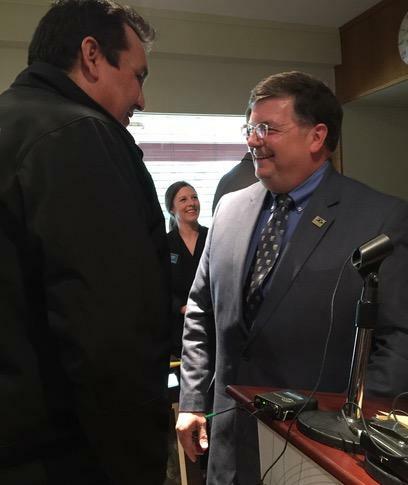 Kennedy is stepping down from the Yellowstone County Commission July 30, 2016. Two years remain in Kennedy's term. He adds he wants to make sure the county is ready for MontanaFair 2016 because the revenues generate contribute 25% of the budget. Kennedy says he hopes he has helped the county on issues such as roads, mental health, and childcare. Kennedy is confident the Democratic party will find a suitable replacement to fill the remaining 2 years of his term. “So it’s time for the next generation to come in,” he says. Kennedy sees his retirement as opening a door. “We’ll take that opportunity and we’ll give the next generation an opportunity to take my seat on the commission and move it to the next level,” he says. Kennedy says he’s looking forward to returning to roots, education. He calls it his passion. Foundation Board Chair Bobby Anner-Hughes says Kennedy was chosen after a national search. She says the search committee did approach Kennedy and asked him to consider applying for the position. The MSUB Foundation is an independent, non-profit organization that provides support to the students, faculty and campus community. Bill Kennedy, R, greets supporters after the press conference announcing he will be the new President and CEO of the MSUB Foundation. Besides raising money for scholarships, the Foundation is raising money for the new science building, Yellowstone Hall. Kennedy will start as President and CEO of the Foundation August first.